QUESTIONHow will installation of a Magnehelic® gage 150' away from the pressure source affect accuracy? ANSWERAccuracy will not be affected, but response time will be increased in proportion to the length of the tubing. QUESTIONWhich Capsuhelic® gage ports could be connected to the pressure source in liquid service? ANSWERThe bottom ports. This allows bleeding of entrapped air from the top ports to eliminate reading error due to compression of entrapped air in the gage. Bleed fittings should be installed in the top ports. 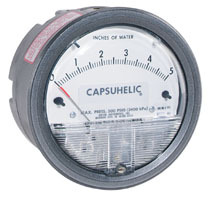 QUESTIONCan the standard Magnehelic® or Capsuhelic® gage be installed outdoors? 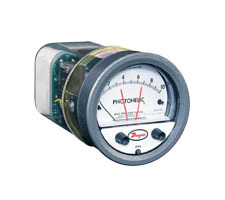 QUESTIONCan a standard Magnehelic® gage be used for natural gas or propane service? ANSWERNo. As the silicone diaphragm will be attacked by these gases. A Buna-N diaphragm should be specified. QUESTIONWhat happens when a Magnehelic® gage equipped with the low temperature option is operated below -20 degrees Fahrenheit (-29 degrees Celsius)? ANSWERBelow that temperature the accuracy of the gage deteriorates beyond our published specification due to stiffening of the diaphragm. QUESTIONWhat restrictions, if any, are imposed for the Magnehelic® and Photohelic® gages in vacuum service? ANSWERIn applications involving higher vacuums than 20" Hg, leakage due to gage housing porosity becomes the limiting factor. QUESTIONMay a standard gage be reconfigured in the field from automatic to manual reset? ANSWERYes. By simply making a wiring change on the relay terminal board per the information in the instruction bulletin. QUESTIONHow much may the published pressure and temperature specifications for Dwyer gages and controls be safely exceeded? ANSWERPublished specifications may not be exceeded! To do so will void the warranty as well as expose the customer, the stocking representative, and Dwyer Instruments to product liability action. QUESTIONIs National Institute of Standards and Technology traceability available for the Magnehelic® Gage? ANSWERNo. But Magnehelic® gages can be given a special 6 point calibration check with an NIST traceable master gage and a certificate can be supplied. QUESTIONHow do I hook up my Magnehelic® Gage? ANSWERIn Bulletin A-27 under operation, it explains how to connect the Magnehelic to the following applications: positive pressure, negative pressure, and differential pressure. QUESTIONWhat approved accessories go with the Model TDL-10? 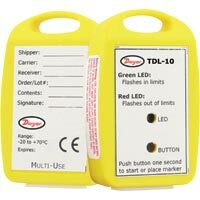 ANSWERA number of approved accessories will greatly contribute to the featureset of the Model TDL-10. 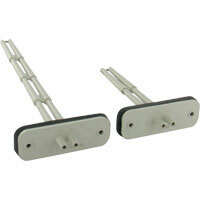 Please check the corresponding product page to view the list of available accessories. 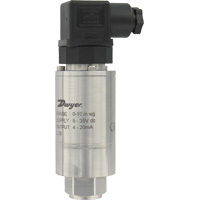 QUESTIONWhy must Dwyer pressure switches be mounted with the diaphragm in the vertical plane? ANSWERIn other than a vertical plane, the diaphragm can sag and cause a shift in set-point or a change in the adjustable set-point range. The switch may even fail to reset at the minimum set-points. This is the same phenomena that causes inaccuracy in Magnehelic® and Capsuhelic® gages when mounted in other than a vertical position. QUESTIONHow can a standard 1910 pressure switch be used to sense pressure in an oven operating at 200 degrees Celsius? 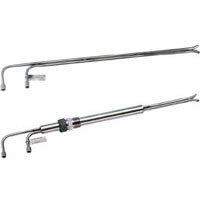 ANSWERUse metal tubing for sensing lines long enough to safely dissipate the heat. 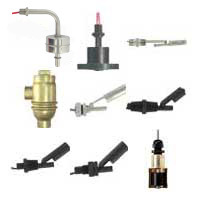 QUESTIONFor which pressure switch applications are gold contacts recommended? ANSWERFor "dry circuit" applications where little or no current is flowing in the circuit to help burn off contact dirt and oxidation. Switches used with solid state circuits often fall in this category. QUESTIONWill a Dwyer pressure switch be damaged if the pressure exceeding the maximum set-point is applied to the switch? ANSWERNo. Not unless the maximum pressure rating of the switch is exceeded. 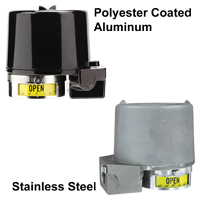 QUESTIONDoes Dwyer offer a fully UL/FM/CSA approved explosion proof pressure switch? ANSWERYes. The 1950 and 1950G Series. QUESTIONCan the standard H2 pressure switch be used with water? ANSWERNo. The brass or SS housing must be specified for compatibility reasons. The aluminum housing can leak into the switch. 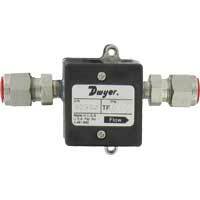 QUESTIONHow are Dwyer flowmeters properly read? 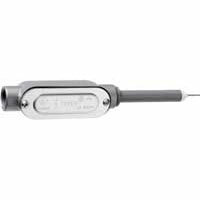 ANSWERThe flow rate is read at the maximum width portion of the float regardless of shape. QUESTIONWhat factor is used to correct for different flowmeter inlet pressure? ANSWERIf the flowmeter is exhausting to atmosphere, no correction factor is needed. If back-pressure is present due to downstream plumbing or restrictions, this error can be corrected utilizing the conversion curves in our full-line catalog or the following equation. QUESTIONWhy are top mounted valves recommended for flowmeters used for vacuum service? ANSWERTo maintain atmospheric pressure in the indicating bore and therefore preserve accuracy; an inlet restriction would reduce pressure in the bore. This is essentially the opposite situation to outlet back-pressure in a pressure system which increases pressure in the bore and also affects accuracy. Remember that all standard Dwyer flowmeters are calibrated for standard atmospheric pressure and temperature in the bore. 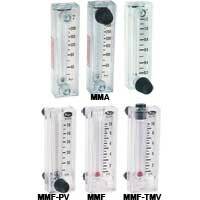 QUESTIONIs the Rate-Master® or Visi-Float® Flowmeter compatible with any media? 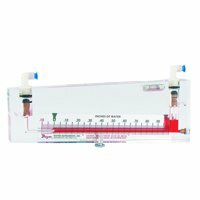 ANSWERThe Rate-Master® Flowmeter is manufactured from a polycarbonate plastic and the Visi-Float® Flowmeter is manufactured from acrylic. Compatibility charts need to be reviewed to determine if these materials of construction are compatible with your media. 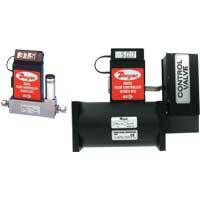 QUESTIONAre special ranges available for the Rate-Master® and/or Visi-Float® Flowmeter? ANSWERYes, other ranges are available which are not specified in our catalog. Please feel free to contact Dwyer with questions on these ranges. QUESTIONWhich flowmeters are available with NIST traceability? ANSWERAll Dwyer Mini-Master®, Rate-Master®, and Visi-Float® flowmeters are available with NIST traceability on all air ranges except for RMA-1, RMA-11, RMA-150, RMA-151, VFA-1, VFA-21 and VFB-60 models. QUESTIONIs a Dwyer Certificate of Conformance offered with any of the flowmeter models? ANSWERA standard Dwyer Certificate of Conformance can be offered with all Dwyer Mini-Master®, Rate-Master®, and Visi-Float® flowmeters on all water ranges (or other compatible liquids). QUESTIONWhat is the key feature of both Proximity position indicators and level switches that sets these products apart from all competitors? 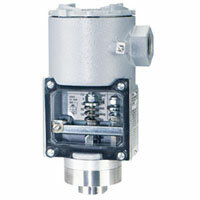 QUESTIONHi-Flow™ control valves call out ANSI B16.104 Class IV flow leakage. What does this mean? ANSWERANSI B16.104 is a testing specification for control valves. This specification has actually been superseded by ANSI/FCI 70-2 Class IV. The class IV designation defines the allowable amount of leakage through the valve seat in the closed position. Class IV allows for .01 percent of the rated flow (Cv), to pass through the seat. Class IV is common for metal to metal seated valves. QUESTIONWhat if I need parts for my Hi-Flow™ control valve? ANSWERMany Hi-Flow™ valves have been in service for 15+ years with all original parts. 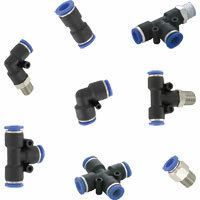 However, since Hi-Flow™ valves are commonly used in steam service, a severe application, some parts may wear over time. Unlike other control valves, Hi-Flow™ valves are designed with removable seat rings making repair or replacement of components an option. Although all parts are available, you will probably never need more than a seat ring, plug assembly, and stem packing to have a valve that is like new. QUESTIONWhat two basic types of position indication are provided with the Proximity position indicator? QUESTIONHow many different size housings does Proximity provide for position indication? How many switches in a single housing? ANSWERTwo sizes: 2-switch and 4-switch housings. QUESTIONWhat two types of continuous signal feed back can Proximity provide with the position indicator? ANSWERResistive (potentiometer) and current (transmitter). 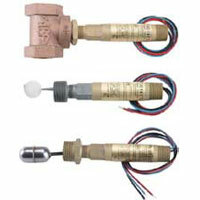 QUESTIONWhat are the two dry product level switch model types? What ranges do they cover? How are they adjusted? How many set-points do they have? 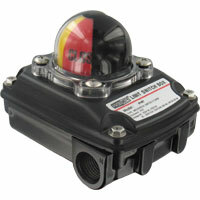 ANSWERGSD3DA - gravity (elastomer) suspension, aluminum housing, polyurethane diaphragm, standard 15 amp switch. PSD16A - pneumatic (fabric), suspension, aluminum housing, filter fabric diaphragm, polyester 150 micron permeability, standard 15 amp switch. They can be adjusted to any level. They are adjusted by a screw adjustment. One setpoint available. For additional options, you could look at our CLS2 Series Capacitive Level Switch, TFLS Series Tuning Fork Level Switch, PLS and PLS2 Series Paddle Level Switches. QUESTIONWhat is the advantage of using a manometer rather than a Magnehelic® gage? 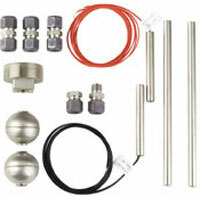 ANSWERDwyer Instruments manufactures many different types and styles of manometers with various accuracies and prices for different applications as well as the Magnehelic® gage. 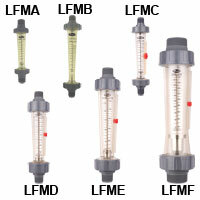 For example, some of the many manometers we manufacture are Hook Gage Manometers with ±0.001 inches water column accuracy; Microtector® Portable Electronic Point Gage to ±0.00025 inches water column accuracy; Handheld Digital Manometers with ±0.5 inches water column accuracy; very inexpensive Mark II Molded Plastic Air Filter Gages at ±3% inches water column accuracy. The key point is that we offer many manometers and the selection depends on your specification, application, convenience needs and pocketbook. Some of the key factors to consider that affect manometer performance and usage are: Characteristics of Indicating Fluid, Readability and Leveling. You should read "Measurement of Pressure with the Manometer" in our catalog to fully understand the importance of these factors and their effect on your reading with the manometer instrument. For many applications people prefer to use our Magnehelic® (dial style) gage with ±2% inches of water column accuracy because of convenience, accuracy, etc., plus when compared to a manometer, it eliminates indicating fluid, need for leveling, and some prefer the readability. If you consider manometers and Magnehelic® gages to measure low air or gas pressures ­ positive, negative, or differential, you have a wide selection to choose from and your application needs can be met with our very broad product line at a great value. 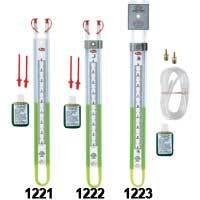 QUESTIONWhy doesn't 1 inch on the scale of a 1223-12-D manometer equal 1 inch on a ruler? ANSWERThe calibration scale on the manometer has been compensated for the specific gravity of red gage fluid which is less than water. 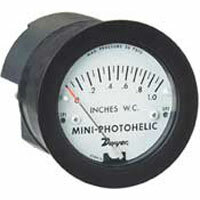 QUESTIONSince water will not mix with oil, why can't a D-style manometer be used to measure water pressures? ANSWERThe weight of the water itself is also being measured which results in erroneous readings. 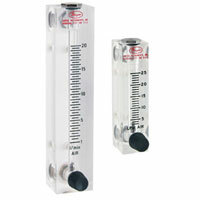 QUESTIONWhat are the principle advantages of red gage fluid over water for use in manometers? ANSWERRed gage fluid is slow to evaporate, won't freeze, is more readable and produces slightly expanded scales for better reading resolution. QUESTIONWill the water manometers freeze? 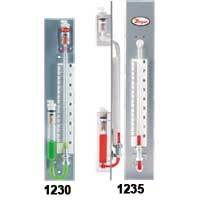 ANSWERYes, if the temperature drops below 32 degrees Fahrenheit, the fluid in the manometer will freeze. The fluid used in "W/M" style manometers is water-based with a small amount of fluorescent green fluid to enhance the meniscus. The other gage fluids have a lower freezing point, however, it is recommended that the manometers be stored above 32 degrees Fahrenheit. 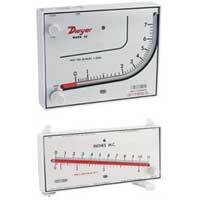 QUESTIONHow does a manometer measure gage and differential pressure? ANSWERManometers simply measure the pressure by indicating the amount of displacement a liquid of known weight undergoes when a force is applied. This concept is best explained through illustrations in our Bulletin D-21 or in our Application Guides on how to use pressure products. 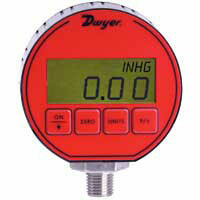 QUESTIONIs routine maintenance required for a Dwyer red gage fluid type manometer? ANSWERYes. The zero point should be checked periodically as well as the fluid level. After a year of service, particularly with dirty air, the fluid should be replaced to assure that specific gravity changes are not affecting the accuracy of the reading. QUESTIONWhat are the advantages of using a transmitter in a two-wire configuration as compared to a three or four-wire configuration? ANSWERA two-wire configuration is the most popular wiring hook-up used today for transmitters utilizing a loop power supply. 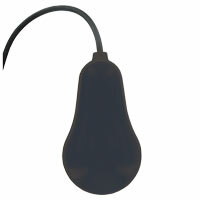 It simplifies initial hook-up and troubleshooting, saving the customer time and money. QUESTIONHow can the 4-20mA output signal of our transmitters be converted to a 1-5VDC or 2-10 VDC output signal in the field? ANSWERThe 4-20mA output signal from our transmitters can be converted to a 1-5VDC or 2-10 VDC signal by inserting a 250 ohm or 500 ohm resistor respectively into the output loop. QUESTIONDefine Warm-up Time? Response Time? Loop Resistance? ANSWERWarm-up Time can be defined as the amount of time it takes the transmitter to "settle down" after initially being powered up to be able to provide its most accurate readings. 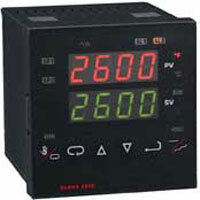 Response Time is the amount of time required for the output to change after the input has changed. Loop Resistance is the maximum amount of resistance that can be in the current loop without dampening the transmitters output. Loop Resistance is a direct relation of input voltage. QUESTIONA customer would like to get switching capability, local pressure indication, and a 4-20 mA output signal all in one device. Do we have a product to offer them? ANSWERYes. The DH, DHII or DH3 possess high/low set points, digital gage display and 4-20 mA full scale output signal for air and compatible gas. The EDA, DPG-200, DPT and the MDPC possess high/low set points, digital gage display and 4-20 mA full scale output signal for compatible fluids. QUESTIONWhat is specified by the temperature coefficient and how is it important to my readings? 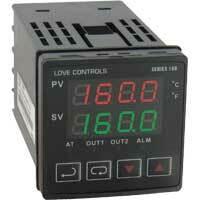 ANSWERAs the ambient temperature changes, the output current will drift slightly. The temperature coefficient specifies the amount of drift per °F/°C. Since the temperature affects the transmitter output, the temperature coefficient is important to accuracy of your reading. QUESTIONWhat precautions should be taken when making an outdoor installation? ANSWERKeep the junction box above the nearest low point in the conduit run and make sure the conduit connection is sealed to prevent condensation from running into the switch. QUESTIONWhy is the method of mounting a V4 of concern? ANSWERThe vane and magnet keeper assembly near the hinge pin are very close to the mounting threads. Combined with the fact that pipe fittings are available in many variations, this produces a possibility that the customer will mount the switch in a fitting that prevents the vane from swinging. To make things worse, there is usually no way the customer can tell that this has happened. Mounting in a threaded branch connection avoids this clearance problem. QUESTIONHow is "deadband" defined as related to the V4 switch? ANSWERDeadband is the difference between the switch actuation flow and switch deactuation flow; in general, V4 flow switches have a 45% deadband meaning deactuation occurs at approximately 55% of actuation flow. QUESTIONCan a V4 switch be installed in a vertical run of pipe? ANSWERYes, but not the standard model. Vertical pipe installations must be specified on the order and require a special spring loaded vane. Only for use in vertical up-flow applications. Please see option -V in online configurator. 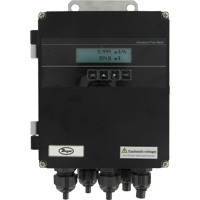 QUESTIONWhat precautions should be taken when installing a V4 switch in an extremely high flow application? ANSWERInstallation with a 2 1/2" threaded branch connection is recommended to allow the vane to swing out almost parallel to the flow to reduce stress on the vane and pressure drop in the system. 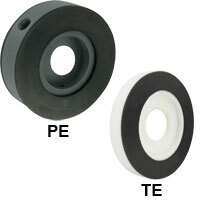 QUESTIONWhat material is used as a seal between the process fluid and the electrical portion of the switch? ANSWERThe body material; as there is no separate "seal" since the body is machined from solid stock and the switch is magnetically actuated. QUESTIONWhat is the pressure drop across a V6 Flow switch? ANSWERPressure drop (head loss) is a function of both set point and flow rate. Typically, pressure drop at actuation flow rate listed will be 5 – 10 PSID (0.34 – 0.69 Bar). Pressure drops at other flow rates will vary in proportion to the change in flow. QUESTIONAre custom vanes for the V6 available? ANSWERYes, we can supply customer vanes for the V6. The information we would require is as follows: pipe size, flow direction (horizontal, up, down), mounting, pressure, temperature, specific gravity, flow rates (maximum normal, actuation/de-actuation). Please see custom vane option in the online configurator. QUESTIONWhy should a customer be discouraged from buying a V6 without a tee and installing it in his own tees? ANSWERTwo reasons: One, the customer will frequently tighten the body in the tee one turn too many, resulting in the vane hitting the tee. This bends the vane and it can jam up even after the switch is backed out one turn to its proper position. Two, there is also a wide variation in tee dimensions between manufacturers which aggravates the problem. QUESTIONWhat type of pressure drop is expected in the V6-LF? ANSWER5-15 psi, however, it will vary in proportion to the flow rate. QUESTIONIf a customer complains the impeller in his sight flow indicator is not turning, what is most likely the problem? ANSWERUsually the impeller is fouled or the indicator is doing its job and actually indicating no flow. QUESTIONIf a customer claims the plastic impeller dissolved in plain water, what probably happened? ANSWERThe customer exposed the sight flow indicator to fluid temperatures of 400-500 degrees Fahrenheit, considerably in excess of the published temperature specification. QUESTIONWhat does actuation and de-actuation mean? ANSWERActuation means that the flow rate has reached a point where the microswitch trips or the contacts of the microswitch change state. De-actuation means that the flow rate has decreased to a point where the microswitch returns to its normal state. QUESTIONWhy is the minimum specific gravity important on the float level switches? ANSWERIf a medium has a lower s.g. than the rated minimum for a float, the float will sink through the media and the switch will not operate. QUESTIONWhat else needs to be specified when ordering an L4-TOP? ANSWERThe vertical and horizontal lengths of the float arm. 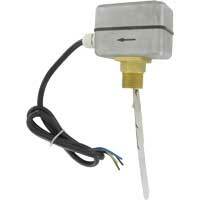 QUESTIONCan the V8 float switch be used with acids due to its material of construction? ANSWERNo. The V8 contains a 316SS pin and spring as well as a ceramic 8 magnet that are not compatible. QUESTIONCan the V10 flow switch be mounted for use in a vertical up-flow application? ANSWERYes. The standard V10 has a spring return on the vane which allows for mounting in any position. QUESTIONHow are the F6 & F7 vertical level switches converted from N.O. to N.C. or vice versa? ANSWERThe float is removed and replaced upside down. QUESTIONHow does the F6-HPS-11 Level Switch attach to my tank? ANSWERDrill a 1/2" hole in the side of your tank. With the F6-HPS-11 body inside the tank, insert the screw and exposed wires through this hole and secure the unit in place with the corresponding nut. ANSWERThe ratio of energy emitted by an object to the energy emitted by a blackbody at the same temperature. The emissivity of an object depends upon its material and surface texture:a polished metal surface can have an emissivity around 0.2 and a piece of wood can have an emissivity around 0.95. QUESTIONDoes Dwyer offer any certification on their products? ANSWERYes, at an additional cost, contact our service group for pricing; we are able to provide NIST certification on many of our products. We can also issue a certificate of conformance at no charge for all of our products stating that they meet our published specifications. QUESTIONHow often do our pressure gages need to be recalibrated? ANSWERThere is no set life span for any of our products, as it varies based on usage. For critical applications, the unit should be tested 2-3 times a year. Under normal circumstances, the units should be tested annually. QUESTIONWhat is an RMR Photohelic®? 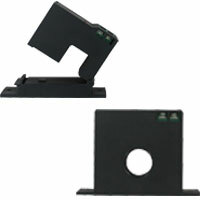 ANSWERThe RMR option is for a remote mounted relay, where the relay pack is seperate from the gage. 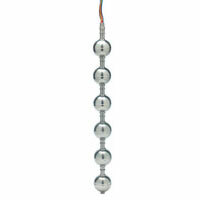 The unit comes with a standard interconnecting cable that is 3 feet long. QUESTIONWhat is the NEMA rating of a Photohelic®? ANSWEROur standard is considered to be NEMA 1 rated for general purpose. We do have weatherproof (NEMA 4X) and explosion-proof (NEMA 7 & 9) enclosures available. QUESTIONCan the Spirahelic® gage be mounted in the horizontal position? ANSWERYes, all that is required is calibration in the horizontal position during assembly. Lead-time would be 2 weeks. 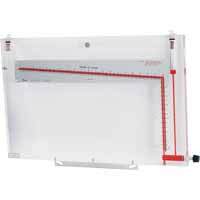 QUESTIONAre air velocity scales available? ANSWERYes, the information we require to supply the proper range is the velocity (fpm or m/s) or velocity pressure (inches of water or kpa) and density of air (lb/ft3 or g/cm3). 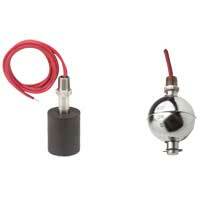 QUESTIONHow do I hook up my Magnehelic® gage for an air velocity application with a pitot tube? ANSWERIn our Application Guides on flow products, we explain very well how to take air velocity readings. 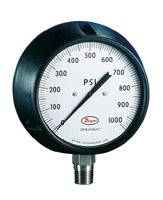 The total pressure connection on the pitot tube is connected to one of the high pressure ports on the gage. The other high pressure port is plugged. 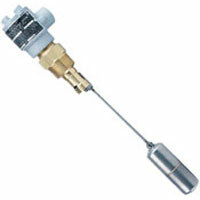 The static pressure connection on the pitot tube is connected to one of the low pressure ports on the gage. The other low pressure port is plugged. ANSWERI.P. 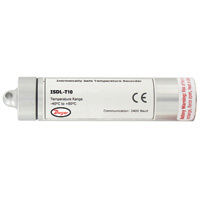 = Ingress Protection; submersible certification - all tests - solids (0-6) and liquids (0-8). QUESTIONHow often should I replace the filter on my 1205A-0 handheld CO analyzer? ANSWERThis filter should be replaced if it begins to appear wet or dirty and can be replaced with Model F195 Air Filter. QUESTIONI am looking to measure velocity in a 4" pipe that is used as air conveyance. We use an eductor and a single stage blower to produce air flow. 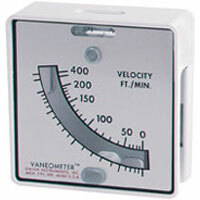 I am looking to measure pressure and velocity. 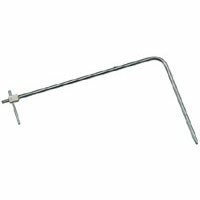 I purchased a Dwyer Pitot tube, 167-7 108024-00 for the job, and I want to match with the right gauge. I need to be in the range of 2600 cuft/min at maybe 0.5psi. Can you direct me to the right gauge with that information? ANSWERTo monitor flow through your 4” pipe, you will have to size the appropriate differential pressure gage. 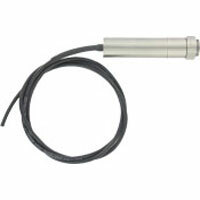 A very common gage that is used will be our Series 2000 Magnehelic gage. This gage can be ordered with a square root output that will direct read in flow units. Upon ordering this part, you will have to specify the maximum differential pressure at your desired flow rate. The following text will bring you to the equations necessary to compute this differential (velocity) pressure. This can also be found in the APPLICATION GUIDES section of our website. QUESTIONTrying to measure differential pressure between OSA and indoors. Using transmitters with a range of +25pa to -25pa. Monitoring pressure variations occur from basically 0pa to 20pa over a short period of time (15 to 30 sec) Building is basically closed during testing, suspect OSA fluctuating due to winds? eddy currents etc. Any ideas, Building under positive pressure is critical for safety reasons Any ideas? ANSWERWhenever you are using outside air for a static pressure reference, fluctuations in outside conditions can cause erratic differential pressure readings. 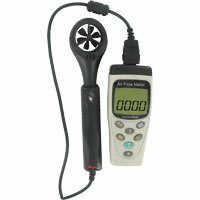 By using one of our outdoor static reference probes, you can diminish the influence of outdoor weather on your reading. 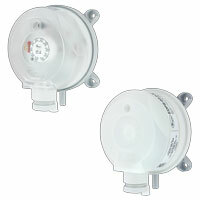 ANSWERWe do offer two voltage options which are -24VAC: 24 VAC Relay Pack or -240 VAC: 220/240 VAC Relay Pack. 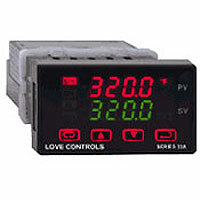 Unfortunately we do not offer a VDC option with the A3000 Series. However, you could consider the Series MP, Mini-Photohelic Differential Pressure Switch/Gage or the Series 3000 MR or 3000 MRS which all offer the 24 VDC Power Requirement. QUESTIONLooking for information on the RS-232 Serial Communications Digihelic Links™ Communications Software, Modbus protocol®. Specifically command format, commands available, and controller responses? ANSWERClick on Modbus® to download this list of protocol. 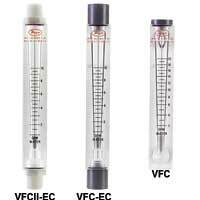 QUESTIONWe have several VA Flowmeters. We are flowing Helium through them and need to know what the flow rate is for the actual helium based on the conversion rates to Air. Do we multiply or divide by 2.69? ANSWERYes, you will need to multiply your reading by 2.69. QUESTIONThe DPMA-502 panel meter, what is the environmental rating? NEMA 1? ANSWERThe Series DPMA doesn't have a NEMA rating. 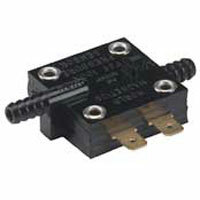 ANSWERForm C contact is a SPDT snap switch. 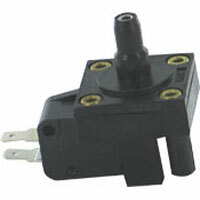 Many of Dwyer’s flow switches have SPDT snap switches. The V4, V6, V7, FS-2, and V8 are some of them. ANSWER If you are worried about power surges and spikes, we recommend that you use a regulated power supply in your system. 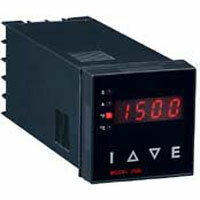 See our Model BPS-005 low cost DC regulated power supply. 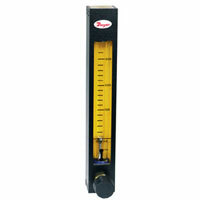 QUESTIONPressure Gauge 7112B-GC100, Is this gage suitable for use with hydraulic fluid? Is there any risk of chemical reaction to internal parts? ANSWERThe 7000B Series Spirahelic gage is compatible with hydraulic fluid. QUESTIONHow many wires do the RTD versions of the TE Series Temperature Sensors have? 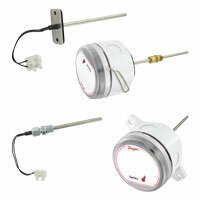 ANSWERThe TE Series Temperature Sensors are all two-wire sensors for both the thermistors and RTD’s. 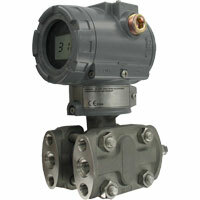 QUESTIONI am looking to use an "Air" flowmeter RMA-6-SSV to monitor CO2 flow. I am wondering if there are are any concerns or correction factors I need to apply. ANSWERA specific gravity correction factor will need to be considered when monitoring other gases with a meter calibrated for air. The correction factor equation is as follows: Q2=Q1 x sqrt (1/S.G.) Where: Q1= Observed Flowmeter reading Q2= Standard Flow Corrected for Specific Gravity 1= Specific Gravity of Air or Water S.G.= Specific Gravity of media being used in flowmeter originally calibrated for air or water. QUESTIONWe would like to use the ILA transmitter along side a photoeye that senses when the part is present so we can record the temperature. The photoeye operates at 880 nm. Would there be interference between the two instruments? ANSWERThere shouldn’t be any interference since the ILA In-Line IR Sensor has a spectral response of 8 to 14 microns (8,000-14,000 nm). QUESTIONWhat connection and program would be used to monitor an ISDL-R10-SS temperature/humidity data logger using a Windows XP computer. ANSWERA free download of the product software is available for the Series ISDL under Product Software. 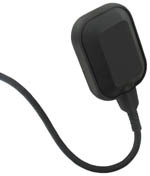 A USB interface device is required to connect to a PC. 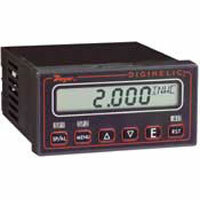 The USB interface device, manual, and software are included with model number DL700. 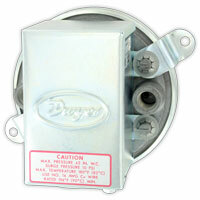 QUESTIONWe use 4 different VA flow controls, we have VA12418 (M) and VA12420 (H). We also have the same size but marked (L). What are the correct part numbers for the "L" and what does it mean? 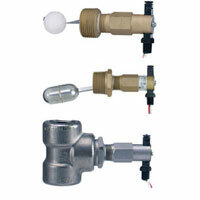 ANSWERThe letters on the knobs of the VA Series tell us what type of valve is on the flow meter. There are many different types of valves and they are sized based on what the maximum flow rate would be (ex. Valve M has a different maximum flow than Valve H). It really doesn’t tell us anything about the part number of the flow meter. This part number should be on the meter itself or on the correlation data sheet that came with it. QUESTIONCan the ASF option be used as a tattle tell? 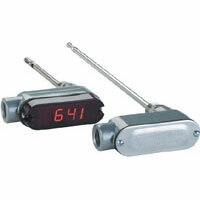 Or do you have something that could be used as a tattle tell on the 2000 series DP gages? ANSWERThe ASF option cannot be used as a tattle tell. It is just there for visual indication of a set point. We have nothing with our 2000 series that can act as a tattle tell, however our series DM-1000 DigiMag will have a peak valve function built in. QUESTIONInstruction Sheet specs on RM series flowmeters list 100 PSI max pressure, but have seen several RMC flowmeter labels with 35 PSI max pressure rating. Some clarification on pressure ratings please? Thank you. ANSWERThe older version of the RMC used to have a pressure limit of 35psi because the backplate was assembled from 2 seperate pieces. The pressure rating increased to 100psi when we began to stamp the backplate from 1 solid piece. QUESTIONCan the Vaneometer model 480 be equipped with a scale to read in inches of water? We want to use the vaneometer to assure we have a pressure differential of -0.01 wc when measured at the door gap to a patient isolation room. ANSWERThe series 480 does not come with a scale reading in inches w.c., the scales would be in velocity units to read air velocity. 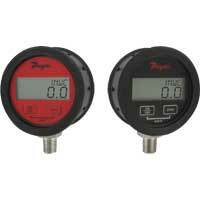 However, we do have differential pressure gages or manometers than can be used to measure the differential pressure in an inches w.c. scale. I would recommend taking a look at our Series 2000 Magnehelic® Differential Pressure Gage, as we do have many customers use these for clean room applications. We have the model number 2000-00N which has a range of 0-0.2. and the major grads will be 0.01” w.c.
QUESTIONI recently purchased an WM2-A-C-01, For my application the pipe is vertical with the water flowing downward. The instructions mention that it should be mounted horizontally. Is it ok to mount vertically? ANSWERMulti-jet meters use multiple ports surrounding an internal chamber to create multiple jets of water against an impeller. The impeller rotation speed depends on the velocity of the water flow. If your water is flowing downward it will not rotate the impeller as it does in a horizontal pipe or in a up flow condition. 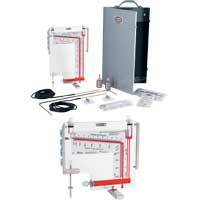 Therefore, you cannot install this instrument in a vertical down flow application and receive accurate readings. 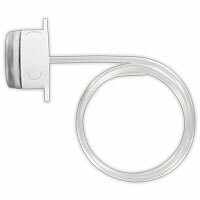 QUESTIONCan a Slack tube manometer be used for water pressure? 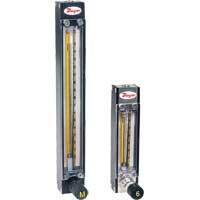 ANSWERThat style of manometer is to be used with air/gases only. 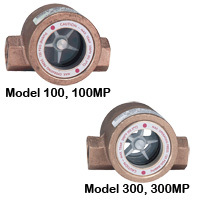 If you need something that reads water pressure, you would want to use something like our Series 490, Series 490A or Series 1211/1212. 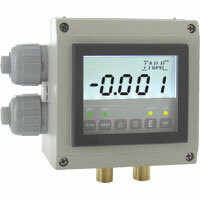 QUESTIONWhat is the difference between a Gas Mass Flow Meter to a Gas Mass Flow Controller? ANSWERThe major difference between the GFM and the GFC is the that GFM is just used to measure the flow going through the meter. 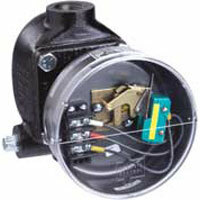 The GFC has the added feature of a motorized valve to control the flow to a desired set rate. Our newer GFM flowmeters (GFM2, GFM3, and GFM4) have some added features to the base GFM unit, such as optional relays, push button configuration, and pressure and temperature monitoring, respectively. 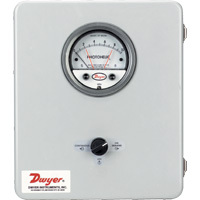 QUESTIONWe have a Dwyer gauge Mark II 25 on a waste oil furnace. Can you tell us how much heat it will withstand if we should get it too close to the heat source or how hot the gauge could get before readings would be incorrect. ANSWERThe maximum temperature the Mark II 25 can be exposed to is 140 degrees F since it has many plastic components that cannot withstand direct heat. QUESTIONCould you confirm the instructions on setting the zero setting on Dwyer Model Mark II 25. I have two different instructions and want to know which one is correct. The correct steps for zeroing are: Turn the zero set knob counterclockwise until it stops, then turn clockwise 3 full turns. This puts zero in approximately the middle of the travel adjustment in either direction. 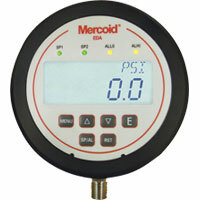 Remove the fill plug and fill with gage fluid until fluid reaches zero on scale. Minor adjustments can be made to adjust zero by adjusting zero knob. Replace fill plug. If gage is overfilled, remove excess by inserting pipe cleaner through the fill port to blot up excess fluid. QUESTIONYour Magnehelic gauge doesn't come with a calibration certificate, do you have any documentation for these gauges to meet these needs? ANSWERWe have 3 options: (1) We can supply a Certificate of Conformance at no charge if you request that certificate at the time of order. The Certificate of conformance would state that each Magnehelic gauge is calibrated to meet the specifications stated on the spec sheet. (2) We offer a factory calibration “-FC” as an option that is a certificate of the standard calibration points at the time of manufacture, for a small fee. 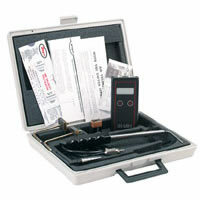 (3) We can also provide a NIST-traceable calibration for an extra charge per gage if that is required. To get the NIST-traceable calibration, you would simply add a “-NIST” to the end of your part number. NIST-traceable calibrations will come with the 6 point calibration certificate. We recommend “periodic calibration” for our Magnehelic, though we leave the specific time-frame up to the end user, since different organizations have different requirements (i.e. government groups often require more frequent calibrations.) If you choose to have the NIST traceable calibration done, the NIST group (the National Institute of Standards and Technology) dictates yearly calibration and it will be printed on the certificate. QUESTIONWhat might be the cause for Magnehelic® gages filling approximately 1/3 full of water, with lots of liquid droplets on the glass. Both are outside mounted on the side of an air stripping tower. 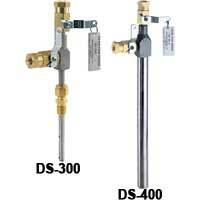 One is a differential pressure gage that measures the pressure drop across a pitot tube. The other just measures the back pressure in the stripper. What can be done to fix the malfunction? ANSWERIt looks like you’re getting some condensation in the Magnehelic®, which is causing it to collect on the bottom of the face. 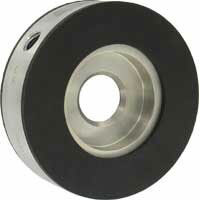 Since the Magnehelic® is not encapsulated, it is not recommended to be used in applications where moisture can form. One option to fix the problem is installing a liquid filter (like an F222) to filter out that moisture. 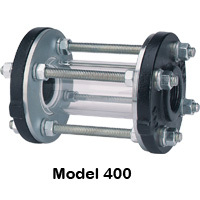 Another option is to install a Capsuhelic (Series 4000), which is made to handle both air and liquid. QUESTIONWhat purpose does the sintered filter perform on the RHP transmitter and does its use preclude adding the LCD option? Is it recommended when transmitter is located just after blower but before cooling coil? ANSWERThe sintered filter is recommended in applications where you expect to be close to the temperature limit of the RHP (near 140°F) because the sintered filter has higher temperature resistance than the standard fiber membrane filter. 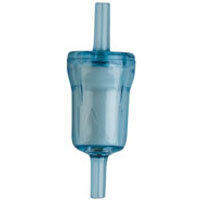 You can order the sintered filter version with or without an LCD screen. QUESTIONWhat is the proper way to wrap the wire around the Current Transformer #CCT40-200? ANSWERIf the current running through your wire is high enough to be detected by the model CCT you have, then you can simply single wrap it as you have shown in the attached PDF you provided. However, if the current is too low to be detected, then you would want to wrap the wire around until the current is high enough to be detected. Here is a link to the service manual for our Series SCT Current Transformer that explains this concept better, Series SCT Instruction Manual. See Figure 4. QUESTIONI have a LOVE 8C controller and am using the Controller Communication Utility (Model SCD-SW Configuration & Monitoring Software) to record data being sent to the PC through the USB cable. The data is displaying and recording, however all I can do to replay the data is to literally watch a video of the data as it was recorded. I am monitoring reactions that are hours long and it would be very helpful to model the data in Excel so that I can look at exotherms, manipulate the data quickly, etc. Is there a setting I am missing to export the data to time and temperature data points, or is this feature unavailable in the software. If unavailable, is there an update in the works to add the export data to excel function. Right now the software is slightly helpful, but not a strong "industry leading" type of software I would expect from Dwyer. ANSWERVersion 1.0.5.0 now supports exporting the logged data to a .csv file. Previous versions of the software do not support this feature. ANSWERThe Model 310 manometer does not require any calibration, as long as there has been no physical damage to the gauge. So barring no leaks or cracks, no calibration is needed. We do recommend changing out the gauge fluid every 3 years to ensure proper functionality. QUESTIONWhat is the power consumption (watts) for a model 3000mr photohelix? 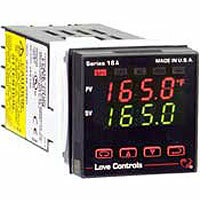 ANSWERThe power consumption for the Series 3000MR Photohelic switch/gage is 3 Watts. 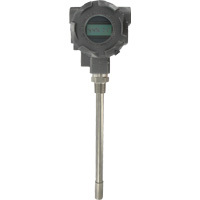 QUESTIONHow many sensing points are there on a 6" DS-300 In-Line Flow Meter? 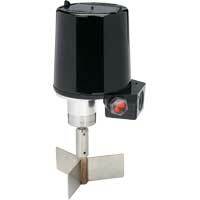 ANSWERThe 6” DS flow sensor has 4 sensing holes. (3” and larger all have 4 holes, sensors smaller than 3” have 2 holes). QUESTIONWe have a defective 629-04-CH-P2-E5-S1-3V DP sensor. The technician only wants to replace "just the sensor", not the entire manifold assembly. Can you give me the part number for this sensor? 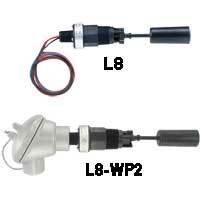 ANSWERHere is the part number you could use to replace just the sensor: 629-04-CH-P2-E5-S1. The “-3V” at the end of the model number is the valve manifold option. 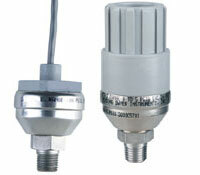 For any unit just order the model number before the “-3V” as a replacement pressure transmitter. QUESTIONMy quesiton is regarding PAFS-1000 series averaging flow sensor. Is the K factor provided in the instruction manual a direct multiplier to the velocity measured? i.e. v_actual = v_measured * K.
ANSWERYou are correct. V_actual = V_measured * K.
QUESTIONEDPS series, can the 'delta-P' screw be used to increase or decrease deadband? ANSWERThe ∆P screw should never be adjusted. It is used to calibrate the instrument to make sure it will switch within the specified range. QUESTIONWhat would be the consequences of using a DPGA gauge on a water system instead of a DPGW? ANSWERThe DPGA can only be used for air and compatible gases. If you use the DPGA for liquid service, it will ruin the internals of the gage causing irreparable damage that would not be covered under warranty. The DPGW should be used instead for liquid applications. 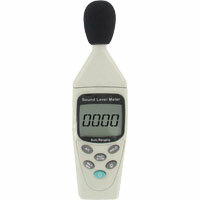 QUESTIONWhat's the sample rate of the 475 digital manometer series? Is there an average function of the the past samples? ANSWERThe sample rate is 1 reading per second. There is no average function of past samples. 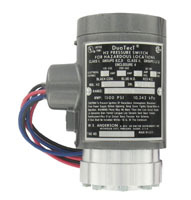 QUESTIONI am using a differential pressure transmitter model 629-02-CH-P2-E5-S1-LED to measure differential pressure of water. How do I convert the 4-20 mA signal to the differential pressure reading? ANSWERThe 4-20 mA output from the 629 is linear over the range, which in this case is 0-10 PSID. Therefore, a 4 mA output will coincide with a differential pressure of 0 PSID, and a 20 mA output will coincide with a differential pressure of 10 PSID with a linear relationship between those two points. With that information, you should simply be able to scale your receiver accordingly. 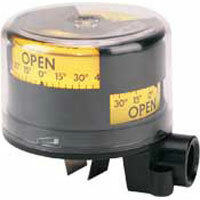 QUESTIONDo the MPR Miniature Pressure Regulators require a constant flow of air on the outlet? i.e. can they be used to pressurize something to a specific pressure? We have some tanks that need to be pressurized to specific pressure-anything over which would cause damage. If these regulators are set to the desired pressure, will they equalize out once that pressure in the tank has been obtained? 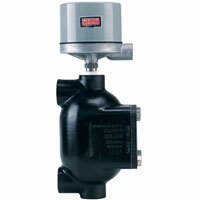 ANSWERThe MPR series miniature pressure regulators are designed for a constant flow of air on the outlet. They can limit or control the pressure going out, but they are not capable of monitoring pressure downstream of the device and controlling the system pressure accordingly. QUESTIONI am using DH3 Digihelic differential pressure controllers for my applications. The instruction says that "the Alarm can be reset by the RESET key on the front panel, or an external reset switch". For the second case (reset by external reset switch), could you let me know how to do it? The instruction doesn't provide any related detail. Thanks in advance. ANSWERUnfortunately, contrary to what was printed in the instruction manual, the DH3 does not have the ability for the alarm to be reset via an external reset switch, mainly due to the limited number of pins available in the electrical connector. 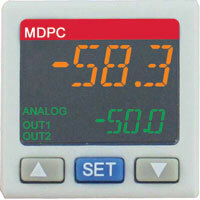 This feature is only available in the DH and DHII series Digihelics. QUESTIONIs there a limit to the length of tubing used on the DCP100A pressure Module? ANSWERThere is no limit to the length of tubing you connect to the DCP100A pressure module. It can be as long or as short as you need for your application. However, please note, that the longer you make the tubing, the longer the response time of the DCP100A will be. 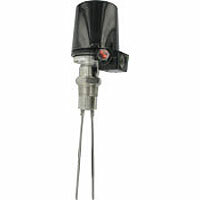 QUESTIONSeries 672 Low Pressure Transducer, is this pressure transmitter suitable for use with Natural Gas? The specs just mention 'suitable liquids and gases", but I don't see a list of what is suitable. 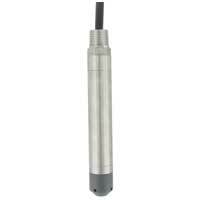 ANSWERNo, the 672 series low pressure transducer is not suitable for natural gas. It is not explosion proof nor compatible with combustible gases or liquids. 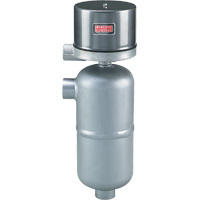 As an alternative, depending on the range you need, I would recommend the 636, 3100, 3200G, or IS626 series pressure transmitters. QUESTIONOur client has an MBLT pressure transmitter that appears to be malfunctioning due to scale buildup. The transmitter is installed to measure leachate level in a one-year old municipal sanitary landfill. What can we use to remove scale from the transmitter without damaging the transmitter? ANSWERIf the issue is due to build-up which consequently plugs the small sensing holes, you might take a look at our PBLT2 or FBLT series. They are both more rugged and designed for sludge and slurries, whereas the MBLT and SBLT2 are better suited for cleaner applications such as ground water and wells. QUESTIONIs it safe to soak an MBLT level transmitter in vinegar or muratic acid to remove accumulated scale deposits? ANSWERFeel free to use whatever cleaning chemicals you like to remove accumulated scale deposits as long as the chemicals are compatible with the unit’s wetted materials as specified in our published literature. QUESTIONI see that the SFI-300 MIDWEST Sight Flow Indicator has a flow direction shown as an arrow. What will happen if water flows in the opposite direction? Will the rotating impeller rotate in both directions? 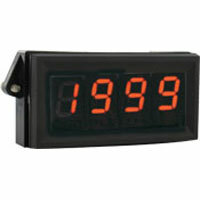 I want to use the indicator on a wakeboard boat to show water being pumped in both directions on a wake ballast system. 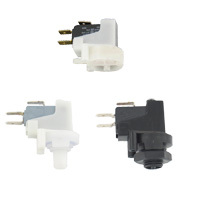 ANSWERThe inlets and outlets for SFI-300 are designed for flow to only be in one direction. You could physically push flow in the opposite direction, but you would risk damaging the impeller, and you would not get a true indication of flow. QUESTIONEFS2 flow meter in PVC. Is this NSF rated? ANSWERThe EFS2 does not have an NSF rating. 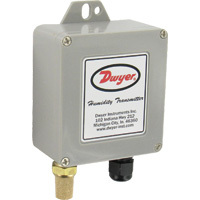 QUESTIONWe have recently replaced a Dwyer air velocity transmitter (PFS1300204) with a Dwyer Series 641. The new sensor works fine for only a few days and then starts reading almost no flow. These devices are used in an Air Scrubber application (exhaust stack). Is this the right application for the Series 641? I suspect that moisture might be the issue, but I cannot confirm. 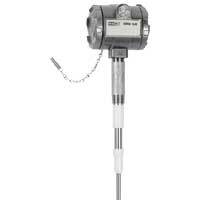 ANSWERI do not think you are using the 641 series air velocity transmitter in an appropriate application. Any moisture or particulates in the exhaust could be causing damage to the hot wire sensor, leading to the failure. The difference in the sensors is probably why you got longer life out of the PFS series, which unfortunately, is no longer available. The PFS series used a glass filled polyester sensor, which is a little more robust and can with stand the elements a little better. In your specific application, you might take a look at our 641B series which uses a heated mass flow sensor which can be used in dirty air environments. QUESTIONIs there a manometer that is compatible with chlorine gas and sodium hydroxide (bleach)? ANSWERUnfortunately, we do not have any manometers available that can handle chlorine gas or sodium hydroxide (bleach). QUESTIONIn the Series 16A the option 936 = Set Point/Process Signal Output 0-10 VDC My Question Is "What Is This Option Used For"? ANSWERThe -936 option on the 16A is most commonly used to remotely monitor a process (for instance, in a different room). An additional panel meter with a 0-10 volt input will allow you to do this. 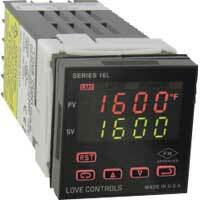 It can also be used as an input to another controller that runs a different system (off of the same process transmitter, for instance). 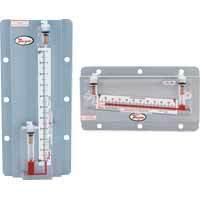 QUESTIONWe are using a Durablock inclined manometer with a range of 0-0.25" of water. What is considered a normal response time to steady state? We are seeing times of 1 minute whereas the manual states 'a few seconds'. Gage fluid is well beyond the recommended three years. Do I need fresh (i.e. new) gage fluid? My supply is as old as what's in the manometer. ANSWERThe manometers have a response time that is dependent on the length of tubing, so a response time of a minute is not uncommon. You may want to check your fittings to make sure there is not a clog present. The gage fluid has a lifespan of three years before the inherent properties start to change, so it is suggested to replace it. 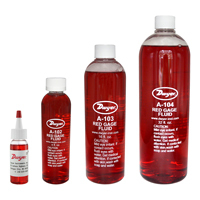 A one ounce bottle of fluid is p/n A-101. QUESTIONMy new Series 476A Digital Manometer scrolls through random numbers and letters like OFL after I tried to zero it. How do I fix it? ANSWERThe 476A will continually display OFL if it has been over pressurized. Feel free to contact our customer service department to setup an RMA if you’d like it repaired. QUESTIONWill a DR4244 show an accurate measurement of flow with Methane or is there a converstion We need to use? 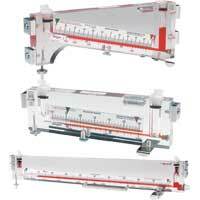 ANSWERThe scale on the DR direct reading flow meters is in millimeters. Therefore, they will come with a conversion chart to convert from millimeters to flow rate for air and water. You will then need to correct that chart to be used for Methane by correcting for the difference in specific gravity. These flow meters can be used to accurately measure the flow of Methane though. QUESTIONI purchased 4 OP-F-3 orifice plates. I do not find a torque value in the IOM for our flanges. What should these be torqued to? 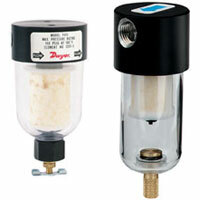 We typically buy 2", 3", and 4" orifice plates and are seeking to standardize on Dwyer. 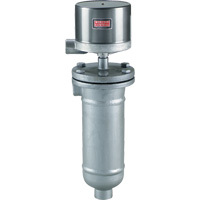 When you provide torque valves include all sizes. 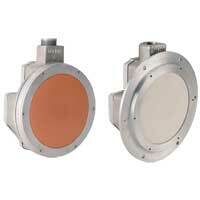 Our flanges are 150# RF. ANSWERFor all orifice plate installations, please follow the recommended flange torque rating based on the specific flanges used. 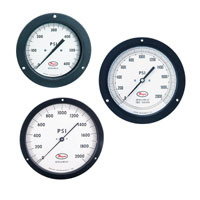 QUESTIONFor the Series 2000 Magnehelic Differential Pressure Gauges, what panel mounts are compatible with the A-135 rubber gasket? ANSWERAny of our panel or flush mounting brackets will work with the A-135 rubber gasket. The rubber gasket just gives you a tight seal between the Magnehelic’s bezel and the bracket. ANSWERThe main difference between the PS224 and PS225 is the micron rating. 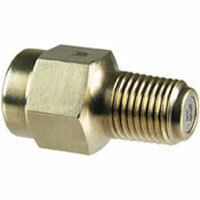 The PS224 for air and gas service has a micron rating of 2-5 microns. 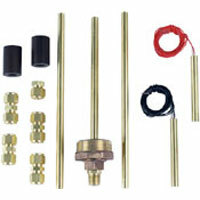 The PS225 for pulsating gas has a micron rating of 1 micron. 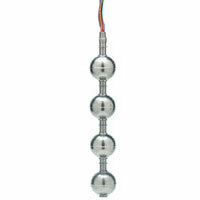 QUESTIONIs the Magnehelic 2000 suitable for use in a Class 1 Div 1 environment? 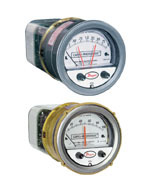 ANSWERNo, the 2000 Series Magnehelic Differential Pressure Gauge does not have any certifications officially allowing it to be used in a Class 1 Div 1 environment. QUESTIONFor the VFA-44-BV product, what is the minimum flow that I can reliably control with a pressure head of up to 4 bar? Will the needle valve function properly at that pressure/flow combination? Thank you. ANSWERAt a pressure of 4 bar (58 psi), the needle valve should function properly and provide reliable control over the whole range, which is 8-40 gallons of water per hour. 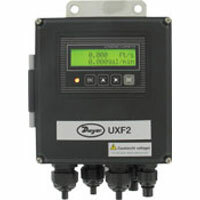 QUESTIONWe have purchased a UXF2 Flowmeter. Is there a way to connect the flowmeter to a laptop and run a program to collect data in a spreadsheet? If so, would you be able to provide the required information and program/software. ANSWERTo communicate to a laptop with the series UXF2, you would need a model that comes with either RS-232C or RS-485 serial communication. Further instructions regarding the serial communication can be found in the manual starting on page 85. 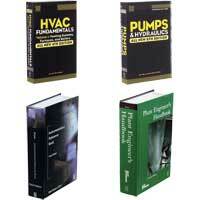 The full service manual can be found on this web page under Literature. 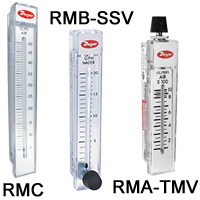 QUESTIONWhere is the date code or lot number located on the flowmeter Model RMA-3-SSV? ANSWERThe date code is on the label. QUESTIONThe gland fitting A-159 is shown as an accessory to the Series 160 Pitot tube. How do you install the fitting past the elbow in the tube? ANSWERThe optional mounting gland, model A-159, is designed to slide over any Series 160, 5/16” diameter standard pitot tube. It should be large enough to slide past the elbow while still being small enough to tighten down on the 5/16” diameter shaft. QUESTIONI'm looking for a dual temp. and humidity gauge for an 8" duct. 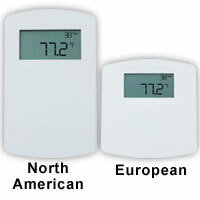 I'm wanting to remote read the temp and humidity on the incoming and outgoing air to an ERV unit. 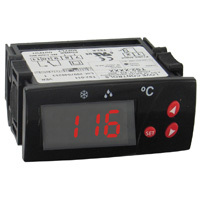 The RHP-3M11-LCD was recommended to me, however, it is a direct read. 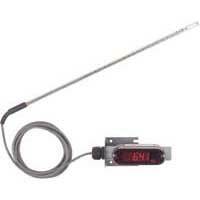 What would be the correct instrument to remote read the temperature and humidity from a distance of 8 feet. The 8" duct is in the attic and I want to read the result in the down-stair hall. I don't want to record nor program the unit, just read the performance. ANSWERThe sensor recommended would be the best option we have for sensing temperature and relative humidity for your application. We do not have any options with a remote display that could stretch as far as you are asking, nor are there any on the market to my knowledge. In every case, you would need to utilize a process output, in this case 4-20 mA, to transmit the readings to a remote display(s) which would accept the process signal(s). 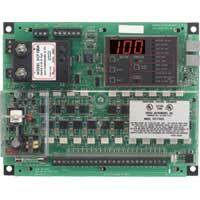 If you are just looking for a remote readout to go with the RHP sensor with no control functionality, then you could look at one of our panel meters, possibly the SPPM, DPMA, DPMW, or DPMP & DPML series panel meters. For assistance selecting an appropriate panel meter, please contact our technical support group at 219-879-8000. 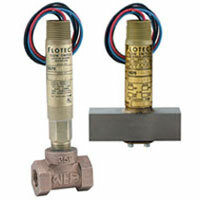 QUESTIONAre your flowmeters (particularly the brass body models) RoHS compliant? Can you provide a statement to that effect? ANSWERYou can find the RoHS Compliance letter in the tab marked APPROVALS on RM Series. QUESTIONDo you have a troubleshooting guide for the 1823-80? ANSWERWe have the Instruction manual which comes with the unit or can be found under the Literature tab on the Series 1800 web page. Beyond that, we would recommend contacting Dwyer’s technical support team at 219-879-8000. 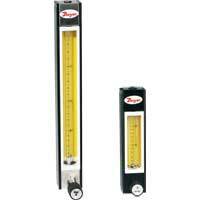 QUESTIONWe use series 475-6-FM Mk III digital manometer. What is the recommended calibration interval? ANSWERWe do not have an official recommended calibration interval. However, we would suggest checking the calibration at least once or twice a year depending on the applciation and how often the unit is used. 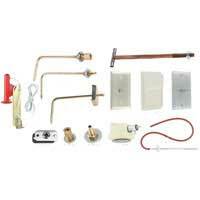 QUESTIONI have a Dwyer Magnehelic, can I pressure test a furnace gas valve with natural gas with this instrument? 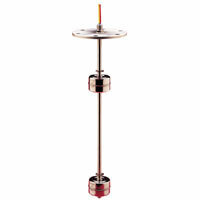 ANSWERThe standard Magnehelic is not recommended for use with natural gas. For natural gas applications, we would recommend a Magnehelic with a Buna-N diaphragm and an oil impregnated case for better chemical compatibility and a reduced leak rate respectively. 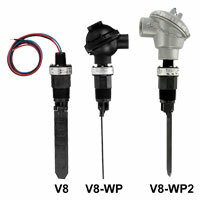 QUESTIONWhat is the maximum flow rating on your Series V6 FLOTECT Flow switch? ANSWERThe maximum flow rating would depend on the specific model of V6 taking into consideration taking into account the line size and whether a tee is installed or not. 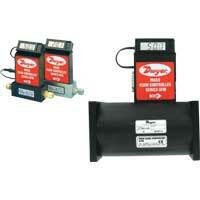 QUESTIONWill the MVS series vacuum switch work if they are in the box with the vacuum. I need to signal when the vacuum in the box, in which the switch is placed reaches a level. The electrical connections are through a hermetic connector on the box. ANSWERNo, the MVS needs to be mounted externally to the vacuum in a reference area or an area open to the atmosphere and connected to the vacuum source via appropriate process tubing depending on the model. 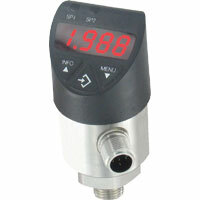 QUESTIONI have a DPG-200 Digital Pressure Gauge. I need to know if Dwyer can make them with a 90 Degree fitting or elbow, or with the fitting coming out of the back of the gauge? 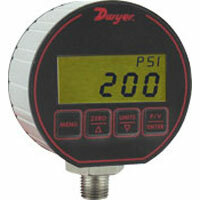 ANSWERThe DPG-200 Digital Pressure Gage is only available with a bottom connection. Having a back connection would not be feasible due to the electrical connection already existing at the back. However, one would have the option of connecting a Series A-2022 (purchased separately) SS elbow to the bottom connection. QUESTIONWe are trying to program a temperature control and receive the following message - Communication error > address 01: no response from controller at register 795 (031A). What could be causing this error? 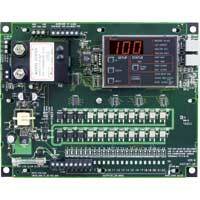 ANSWERThe register 795 is a Modbus register. One of the reasons why there is a communication error is the -992 for the RS-485 communication is LOVELINK Protocol, if you are trying to communicate with Modbus® protocol, it will not work. See the LoveLink™III Software. QUESTIONWe have a Photohelic model 3000-OMR what is the correct replacement model? Is a 3000MR-O the same thing? 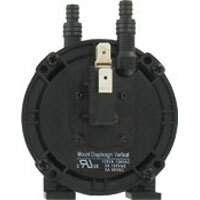 ANSWERBased on the range of 0-0.5 inches of water and the 3000MR/MRS series, the part number is 3000MR-0. QUESTIONUsing MVA-02 to measure fume hood vent flow. Units are set to ft/min. Area set for 6 sq. ft. Readings are incrementing by 20 units at a time, e.g. 39 to 59 to 78 to 98... Specifications indicate resolution in 1. Is this normal? ANSWERReadings that are incrementing by 20 units or so at a time, when using the MVA-02 (Mini-Vane Thermo-Anemometer), occurs when the air flow source is unstable. This is considered normal. QUESTIONI use the TFM-LP Series Flow Meters for some of my OEM project. I am using the Stainless Steel Model at this point because the unit is measuring deionized water, 18 meg ohm deionized water in a clean room environment. Can I use the TFP-LP model with Deionized water? The only difference seems to be the material and pressure rating. The DI loop used is at 60 psi so I'm good with the pressure rating. Is the PPS material good for DI water? 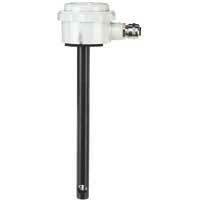 ANSWERThe Dwyer Series TFM-LP Liquid Turbine Flow Meter is compatible with DI water. The PPS material, also known as Ryton, is also compatible with DI water. QUESTIONQuestion 1. What is the input impedance of the SPPM meter with voltage input? I'm replacing an old analog meter with a 0-100 uA movement with a more reliable digital panel meter. Question 2. The analog meter I want to replace has a two-range non-linear vibration scale 0-4 Grms and 1-10 Grms. Is it possible to create non-linear calibration curves for the SPPM? ANSWERThe SPPM with the voltage input has a 10MΩ input impedance. Also, a non-linear calibration curve can be created by merely using the software in the SPPM. One can use the sensor linearization and use up to 20 calibration points and even have your results converted into a .csv file. QUESTIONI have a model V4 flow switch the Micro switch failed I replaced it. I reinstalled and couldn’t accurate switch. Attempted to set as sensitive as possible I couldn’t get it to actuate, I replaced the magnet with one from another unit it works fine! Where can I order a replacement magnet? ANSWERUnfortunately, we do not sell the replacement magnet. It would be best to return the unit to the factory for repair. QUESTIONWhat does UFL displayed on the Dwyer Series 626/628 mean? The input Voltage is correct and it appears to be piped correctly, but my display says UFL and my output to my controller's input is -0.285vdc. QUESTIONI am going to order the d/p switch 1950-5-2-S-AT. Option "-AT" is an aluminum tag. I would like to know the size of the tag. ANSWERAluminum tags may contain 2 lines, approximately 9 characters per line. 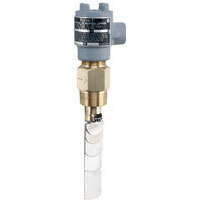 QUESTIONI have a 626 pressure transmitter I want to use in 4-20 mA output mode. Trying to figure out what resistance I need. Two questions: 1) What are the units for the result of Rl-max = (Vps - 10)/20 mA DC? For a 12v PS I get 0.1. Is that ohms, Kohms or what? and 2) Does it matter which let of the receiver (+ or -) input the resistance is placed? ANSWERIf you use the equation RL-max=(Vps-10)/20mA DC without converting the 20mA to Amps then the results units will be in Kohms. The .1 that you calculated is in Kohms, so you will be to convert that to 100 ohms. QUESTIONWhat is the calibration frequency, if required, for a RMB flowmeter? ANSWERCalibration frequency would be once a year if necessary. We offer a NIST calibration certificate which expires in one year. Contact Customer Service at 800-872-9141 Ext. 656 for current cost. QUESTIONModel 1212. How much fluid mixture is required? What is the best method to fill this unit? ANSWERA 1 oz bottle of A-126 Fluorescein green color concentrate is added to a quart of distilled water. 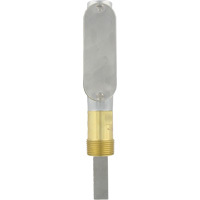 Remove a tubing connector from the manometer and pour the mixture in to mid-point level. Shake the manometer to remove air bubbles and slide the scale so the zero mark is in line with the meniscus of the two fluid columns. 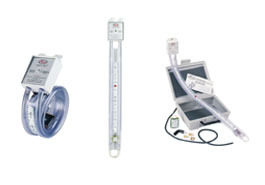 ANSWERThere are two ways to measure air flow in process ducts. 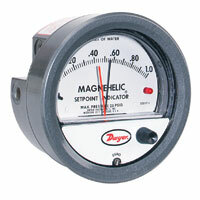 The most common means is the use of a Series 2000 Magnehelic® Differential Pressure Gage. This gage can be ordered with a square root output that will read in flow units. You will have to specify the maximum differential pressure at your desired flow rate. 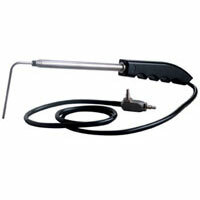 Along with the gage, a pitot tube (connected by means of rubber or vinyl tubing) is also used. 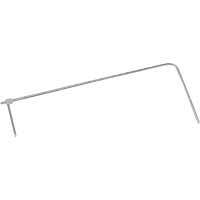 The pitot tube must be pointed directly into the air stream. Care must be taken to ensure that the pitot tube should be inserted at least 8-1/2 duct diameters downstream from elbows, bends or other obstructions which cause turbulence. 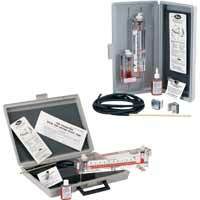 The alternative method uses a 100 AV Durablock® Air Velocity Gage kit. 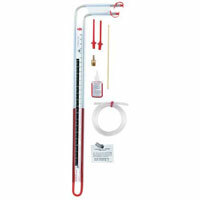 The kit includes a manometer, a stainless steel pitot tube, rubber tubing with connectors, and red gage fluid. The pitot tube, pointed directly into the air stream, senses total and static pressure. The manometer then senses velocity pressure (difference between total and static pressure). QUESTIONWhat are wetted materials in following flow meter part numbers? Are they compatible with HCl? MMF-10-TMV MMF-10 MMF-2-TMV MMF-2 Is MMF available in 4or 5 SCFH full scale? What is ball material for these ranges above? ANSWERThe Series MMF flowmeters have the following wetted materials: Body: Styrene Acrylonitrile Float: Stainless Steel, Black glass, Nylon Valve: Polyurethane For the -2 range, the ball material is 302 stainless steel. For the -10 range, the ball material is nylon. Unfortunately, these materials are not compatible with HCl. Also, the 4 or 5 SCFH range is NOT a standard range for the MMF. The -10 range number would be the logical choice to pick since the 4 or 5 SCFH range would be encompassed. ANSWERThe 160S pitot tube is specifically designed for flow measurement of dirty, particulate laden gas or air so a bit of dust should not be an issue for your application. QUESTIONWould a UFM-1 and a PPM-100 be a good match to monitor and total domestic water usage for an apartment building? The UFM-1 would be able to be powered from the 24VAC output from the PPM-100, correct? Would the PPM-100 be able to interpret the pulse signal from the UFM-1 and be able to totalize that data for up to 2 weeks on the onboard memory of the PPM-100? ANSWERThe Model UFM-1 compact ultrasonic flowmeter sends out pulse signals which can be picked up by the Series PPM pulse panel meter. 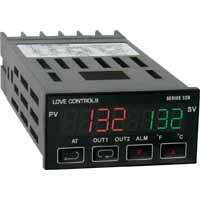 Also, the Series PPM has an isolated 24VDC power supply which the UFM-1 can use. 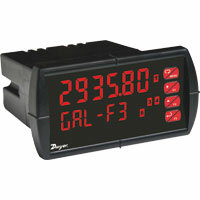 The Series PPM meter has a 6-digit readout which means that it can read up to a million (gallons, liters, m3, etc.). After surpassing the million mark that readout will reset to zero and begin counting again. If needed, the Series PPM can be configured to read continuously, surpassing the millionth mark, by setting the conversion factor on the unit. 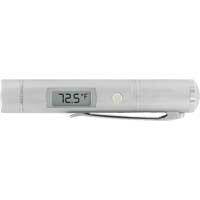 QUESTIONI have four Series 475 Mark III Handheld Digital Manometers that we have had for one year. I would like to have them calibrated, but I do not know where to send them. Do you offer a calibration service for the products you sell? ANSWERYes, we provide NIST calibration for the 475 series both at the time of purchase and afterwards. Please contact one of our customer service representatives at 1-800-872-9141 and provide them with your model number(s). 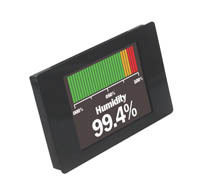 QUESTIONOn the RHP series temp/humidity sensors, is it possible to get a model with a 0-10 V dew-point output and a 0-10 V temperature output? I need dew point output, and would prefer the temperature output to be configured as 0-10 V rather than one of the other formats. I can custom configure a model RHP-3W44, but I wasn't 100% sure that that model would be able to put out a dew point signal. Will it in fact do that? 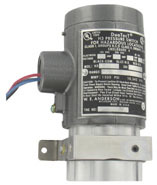 ANSWERI would recommend getting an RHP-3W22 instead of the RHP-3W44. This will give you just the 0-10V outputs instead of a combination 0-10V and 4-20 mA. QUESTIONI have a digihelic DH007. and I would like to know is: could I filter the output relay signal (set point)? Does the delay or dampening functions work on the output or just on the alarms? ANSWERYou can use the Dampening sub menu to stabilize the display from instabilities due to things such as vibration and excessive pressure fluctuations. This dampening feature will adjust the amount of readings which are averaged for each display update. The Digihelic DP controller does not have a feature like the “ALDL” Alarm delay for the relay output though. However, if you use the dampening feature, it will not fluctuate as much and therefore would not cause the reading to surpass the set point and activate the switch unless it truly is reading that pressure. 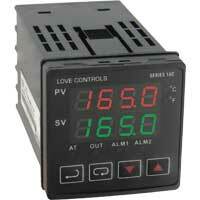 QUESTIONHow to change the selectable °F/°C on a series 16B love control. ANSWERPlease see page 20 in the instruction manual. The parameter to change from °F to °C is TPUn. This parameter will only be available if your inPT is the Thermocouple or RTD as stated. QUESTIONThe catalog page for the CFS2 level switches states, "Optional cables available include those with drinking water suitability." Which cable should I specify for use in a drinking water application? ANSWEROur cables that are compatible with drinking water must be purchased in quantities of 1000pcs. The cables we carry in stock that have a minimum order quantity of 1 pc are not drinking water approved. QUESTIONWhy should I buy a SMART Air Hood®? ANSWERThe SERIES SAH SMART Air Hood® Balancing Instrument is the most accurate and easy to operate air flow hood on the market. By using the included hood stand and wireless communications to the handheld, a single operator can balance a branch in less time than traditional balancing teams. Besides being lighter than most traditional capture hoods, the ergonomic design makes the Series SAH easy to maneuver, with less physical stress. The rugged polypropylene base hood features patented Quad Flow Design Technology for controlling air flow and minimizing back pressure, which yields superior measurement accuracy. The Wi-Fi direct communication gives reliable communication with a distance of up to 200 yards between the hood and the handheld test instrument. ANSWERThe current industry method of balancing is commonly referred to as proportional balancing. Proportional balancing determines the flow between each terminal and the key. The key flow changes with each adjustment of any given terminal, so the balancing technician must estimate a flow for the terminal and adjust the key and the terminal until the correct proportion is achieved. The SMART Air Hood® is designed to provide Predictive Balancing™, an industry first for air flow balancing. Predictive balancing guides the balancing technician on where to go to set the proper flow for each register allowing the system to be fully optimized. The SMART Air Hood® Balancing Instrument includes the PredictAir™ Application Software which reduces the number of steps in the air flow balancing process using Predictive Balancing’s Express Balance mode. Predictive Balancing is a method of predicting the optimal flow set point for each register and the order in which they should be adjusted. ANSWERTraditional industry cone shaped air flow hoods experience two main problems when measuring flow registers; poor accuracy of flow readings and back pressure compensation. These factors contribute to wasted energy and poor performance. Dwyer’s patent pending, state of the art, Quad Flow Design concept is based on controlling the recirculating air patterns that can create back pressure effects, while mixing the flow more evenly and efficiently. This well mixed flow for velocity sampling leads to superior measurement accuracy. QUESTIONWhere do I send the SMART Air Hood® to be calibrated? ANSWERRecalibration of the SMART Air Hood® is fast and easy. Dwyer recommends recalibrating the Hood, at a minimum, once a year to ensure maximum performance. When it is time for recalibration, simply detach, by unclipping the clamps on all four sides, the four Quad Flow Sensing Grids along with the Sensor Module. The Quad Flow Sensing Grids and Sensor Module need to be calibrated together. For your convenience, Dwyer includes with each purchase of a SMART Air Hood® a custom return calibration package specifically designed for the four Quad Flow Sensing Grids and Sensor Module. To ensure no downtime, you can purchase a new set of four calibrated Quad Flow Sensing Grids and Sensor Module, model A-SAH-CK part number 100765-09, ready to install on the jobsite. You can return the original four Quad Flow Sensing Grids and Sensor Module in the custom return package to Dwyer using our RMA process or to any authorized Dwyer calibration service company. Once The Quad Flow Sensing Grids and Sensor Module are calibrated, they will be returned as a set back to you, ready to install on your SMART Air Hood®. ANSWERThe SMART Air Hood® has a 1 year warranty. QUESTIONIs a protective case provided for the SMART Air Hood®? ANSWERYes, the SMART Air Hood® is shipped in a protective travel case as standard. The price is included, there is no extra charge. QUESTIONHow much does it weigh and what are the dimensions? ANSWERDwyer’s SMART Air Hood® is a revolutionary crate design made from a rugged polymer construction. The lightweight design represents the smallest and most aerodynamic design the industry has ever seen. The SMART Air Hood® weighs less than 6 pounds and ¼ the height of current industry air hoods at 24"x24"x12". QUESTIONCan it be shipped as air freight to the job? ANSWERYes. The SMART Air Hood® is shipped with a protective carrying case durable enough to be shipped air freight. Please note that there are shipping restrictions for lithium batteries; consult your carrier prior to shipping. QUESTIONWhat is the range of the handheld device that comes with the SAH? 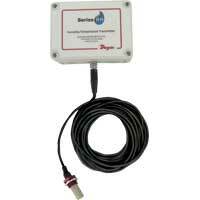 ANSWERThe SAH uses Wi-Fi Direct for communications. Wi-Fi Direct allows the SMART Air Hood® to create a Wi-Fi connection directly to the Dwyer handheld instrument. There is no need for additional equipment needed, like a router. The range is up to 200 yards. QUESTIONCan I store my results for future reference? ANSWERYes, the SMART Air Hood® mobile meter includes job based logging that will track the entire balancing process from beginning to end including a balance summary that shows the actual final flow at each register and the deviation from target. Each branch is considered a job. All of the registers for a job can be setup ahead of time and distributed prior to performing the balance. Setup and modifications to the setup can also be done onsite. Jobs can be paused and resumed allowing for additional activities, breaks, maintenance, without disrupting the balancing process. QUESTIONCan the SMART Air Hood® accommodate various size diffusers? ANSWERYes, various size canvas hoods with an adaptor are available as accessories for the SAH Consult the Dwyer Instruments website, www.dwyer-inst.com for details. QUESTIONWhat type of battery is in the SMART Air Hood®? ANSWERThe SMART Air Hood® operates with a NCR 18650B MH12210 lithium ion rechargeable battery, 3.6v. In addition, 4 AA batteries can be used as backup so the SMART Air Hood® is always available for use. QUESTIONWhere do I go for help on how to use the SMART Air Hood®? ANSWERThe Dwyer website is an excellent source for product information. Videos are available illustrating the SMART Air Hood® features and benefits as well as how to use for balancing. In addition to the Dwyer website, the Dwyer Technical Support Team is available to take your phone calls and assist with questions. Please visit www.dwyer-inst.com for contact information and technical support on the SMART Air Hood®. QUESTIONHow do you do traverse readings with a Pitot tube for air velocity and air flow readings? QUESTIONDoes the 475 model work with propane? ANSWERThe 475 is compatible with combustible gases and is FM approved. 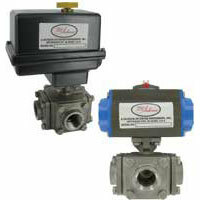 QUESTIONIs there any additional isolation valve typically required for installing the flowmeters? 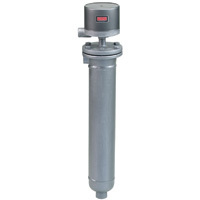 ANSWERThe VFCR Visi-Float® flowmeter with roto-gear technology features a fully functional adjustment and control valve, this series also features an easily replaceable valve cartridge that can be effortlessly replaced in the field. 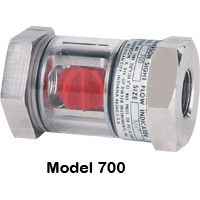 An isolation valve inserted on the flow inlet of the flowmeter or bank of flowmeters is good standard practice in order to allow the termination of flow to the unit(s) in the event that the cartridge needed to be replaced. ANSWERStandard gages are calibrated in the vertical position, and should be used in that position for maximum stated accuracy. Ranges above 17.5 in w.c. may be used at any angle, and stay within specified accuracy, by simply re-zeroing. Ranges below 17.5 in w.c. should be ordered using the –TA tilt angle option with the angle specified. QUESTIONIs there a minimum duct size that this sensor can be used in? ANSWERThe sensing element is about ¾” from the tip of the stem so the duct size would need to accommodate the entire sensing element. If being used in a smaller duct, you will want to verify that the flow range is within the operating range, 1000, 2000, 3000, or 4000 FPM. QUESTIONCan you use a display with the Modbus or BACnet options? ANSWERYes, either the integral LCD Display, A-AVUL-LCD, or the remote display tool, A-435-A, can be used with Modbus or BACnet configurations. ANSWEROur Series 160 pitot tube is specifically designed to monitor or control air velocity or air flow and not water flow. 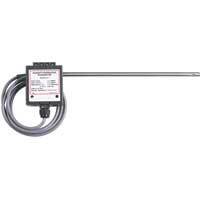 Our Series DS in-line flow sensors can be used for flow rate sensing of compatible gases and liquids for schedule 40 pipe. ANSWERIn process with a first quarter 2019 release estimate. QUESTIONIs there an adjustable BACnet baud rate? ANSWERYes, baud rates 9600, 19200, 38400, 57600, 76800, or 115200 bps are selectable via the display. QUESTIONDo you go down to 2” pipe size? QUESTIONIs there a lockout feature to prevent setup changes? ANSWERYes there is a switch that can be activated to ensure complete lockout of the display. QUESTIONAre there any proven results? ANSWERNo data available currently, but we are working with an outside lab to obtain this data.